With my youngest son’s 1st birthday right around the corner, I was glad to have the opportunity to review products from Discount Party Supplies – one of the leading birthday party supply sites on the internet. From the invitations to the thank you notes, Discount Party Supplies has you covered for the big day. 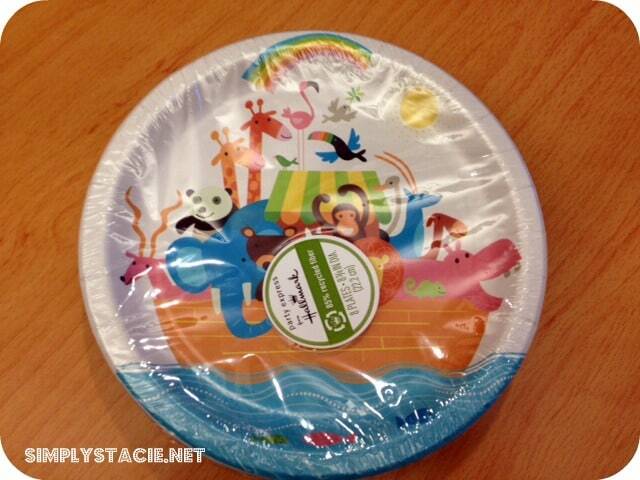 I was sent a Noah’s Ark Whimsical Party Pack for review to go along with the theme for my youngest son’s birthday (he happens to be named Noah!). In the pack were sturdy dinner plates along with coordinating napkins and cups. I knew they were good quality before I even opened them – they are Party Express from Hallmark, a brand name I trust. The pack also included some decorating necessities – a table cloth, balloons, confetti and streamers. All in colors that coordinated together with the dinnerware. 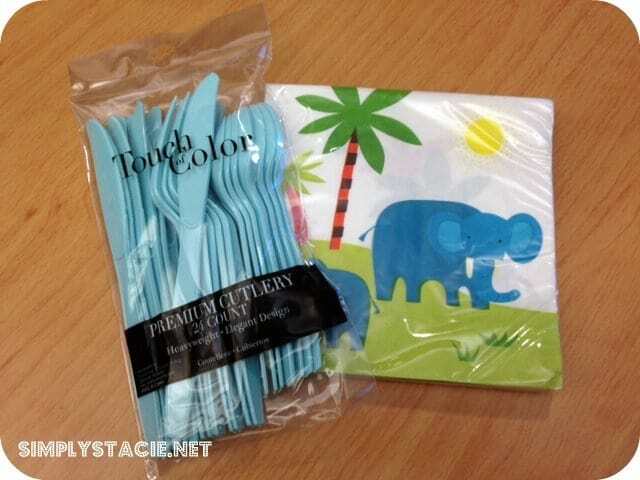 Even the cutlery that is included in the package matches the Noah’s Ark theme of the other elements. The complete party pack (with decorations and table settings for 8) is only $18.99. You can search the Discount Party Supplies site by theme or party type – if you don’t see what you want listed, a quick keyword search will find what you need! I was impressed to see that they even have edible cake images – not something you find on a lot of party sites, and defiantly a must-have if you are making your own cake. They cover a range of events and can help you customize your party. 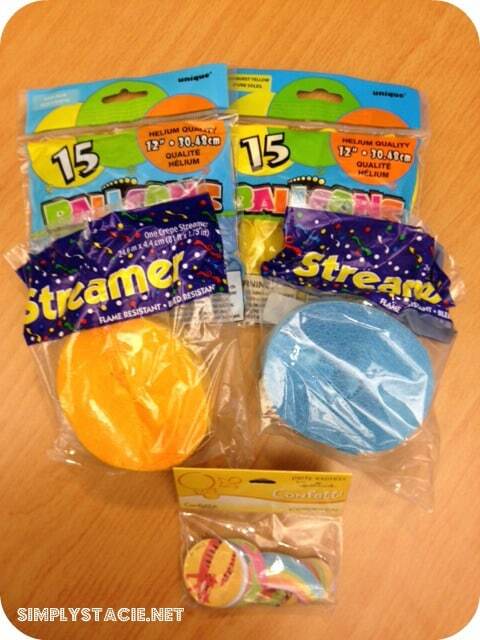 They are a one stop shop for birthday party supplies. A wedding accessories page is in the works as well – be sure to check in with them if you’re planning your big day! You can keep up with Discount Party Supplies on their website, as well as on Facebook and Twitter. Discount Party Supplies wants to help you plan your next big event – one lucky Simply Stacie reader will win a party pack of their choice, customized to any theme. I like the Hollywood Star collection. I like the Metallic Graduation plates. I like the Tangled party supplies. I love the Western Lasso party theme! space party – ha, that’s cute! I like the Cute Cupcake Personalized Banner. Thanks for this giveaway. I like the Pink and Chocolate. Thank-you for this great civeaway. They have such a great variety of themes! I love the sweet 16 stuff, have twins girls who will be 16 this year! i like the Plastic Dessert Dishes: Disposable Dessert Glasses, Plastic Dinnerware. My daughter would love the HOllwood star collection. Pirate Girl is exactly what I’ve been looking for. So excited that it’s going to be available soon! Wow so many good things…I like the Baby Pooh Friends Party Supplies. I like the tickled pink baby shower set. I like the Tangled Ultimate Party Pack. The Teddy Bear Cake Pan is my favorite. love the edible cake decorations, and really appreciate the elegant disposable dinnerware – the plates are such an improvement. I like the Lady Bug party supplies. I like the Hello Kitty Cake Pans (Each).